…that there was no coinage in use in Russia roughly from the XI through the XIII centuries? And before that, the coins in use were Middle-Eastern silver dirhams, whose value was that of their weight. So what was used in Russia instead of coins? “Credit currency” is what historians call it. What a modern concept! Something like paper money, except that it was not paper. It was fur. Or actually, worn-out fur unsuitable for use in garments. How did it work? An Arab traveler recounts that people would bring used furs to a clerk authorized to mark them, and he would affix a marker to the furs, which would be used then as currency. The basic unit of money was the silver grivna (sometimes also called rubl ), a silver ingot weighing roughly a pound. Fur currency was measured in fractions of the silver grivna: the kuna, bela, veksha, rezana represented a certain amount of silver, a constant quantity, just like our paper money and our coins theoretically represent a certain amount of gold. 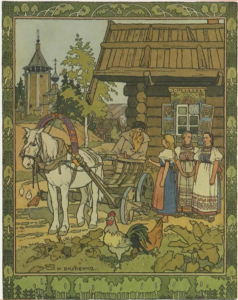 There was no universal system for all the Russian lands, but values were constant within each area or principality. The need for such a system arose out of a lack of native silver, a metal always imported into medieval Russia rather than mined. 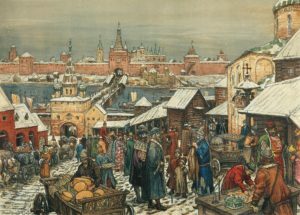 Return to the use of silver coins was progressive and depended on the internal economy of various Russian lands, and of the renewed availability of silver. Eventually, the centralization of power in Moscow brought a unification of monetary systems throughout the territory that became modern Russia, since reforms introduced by Muscovite princes affected all of Russia. Meanwhile, the use of fur money, the application of such a complex concept as credit, and the standardization of fur money within specific areas, prove once again that the medieval mind was anything but simplistic: but of course we all knew this. ‹ How Old Are These Things Anyway?